Hi-Tech's new iteration of Lipodrene continues the heritage of its Lipodrene brethren by including amazing ingredients like synephrine, powerful Phenethylamine isomers, and one BRAND NEW, and never before seen stimulant/weight loss enhancer - Erythroxylum Coca Extract (leaves). What Makes Lipodrene Elite Different from other Fat Burners? The leaves of the coca plant contain several alkaloids and Coca leaves have been chewed and consumed as tea for thousands of years in the high Andes. They are rich in many essential nutrients; Scientific studies† have both confirmed that in their natural form, the leaves are completely safe and non-addictive. What Can I Expect With Lipodrene Elite? PLEASE NOTE: The information above is intended for reference only. Erythroxylum Coca Extract (leaves): One of the biggest advances in weight loss since Ephedrine itself. This popular plant has been chewed for centuries by indigenous tribes to increase energy, curb appetite, and drop excess body weight. Most commonly known for its inclusion of naturally occurring cocaine, this plant has been stripped of its cocaine alkaloids and standardized for its naturally occurring alkaloids, amines, and nutrients that have been shown to help increase metabolic rate, decrease appetite, and help increase fat oxidation. Senegalia Berlandieri: The strongest natural stimulant since pure Ephedrine† This incredible herb contains over 40 alkaloids and amines (in particular phenethylamines) shown to impact intense energy, appetite suppression, and euphoria. Citrus Aurantium: Standardized for Synpehrine, this is one of the most proven weight loss ingredients known to man. It will give users unprecedented appetite suppression, intense energy, and incredibly euphoric feeling. This ingredient sensitizes adrenergic and dopamine receptors in our brain. Theobromine: This xanthine alkaloid allows for enhanced stimulation, while simultaneously lowering blood pressure (a rare feat for any stimulant). Caralluma Extract: This cactus has been used since antiquity in Indian medicine and food. Studies show it help provide significant weight loss by providing powerful appetite suppression. By reducing total caloric intake, weight loss is possible without an increase in exercise. 6,7 Dihydroxybergamottin: Increases the bioavailability of key components of the formula. 5-Methoxytryptamine HCL, L-5- Hydroxytryoptophan: Increase serotonin which helps to increase mood/euphoria, as well as reduce “bad food” cravings. Yohimbe Extract (bark): Yohimbine works by increasing adrenaline levels in the body, as well as inhibiting a regulatory process in fat cells, which normally suppresses fat burning. Alpha-Yohimbine works by de-activating our Alpha-2 Andergenic receptors. These receptors are what causes our body to hold on to body fat longer than we’d like. This means you can get quicker results than ever before! 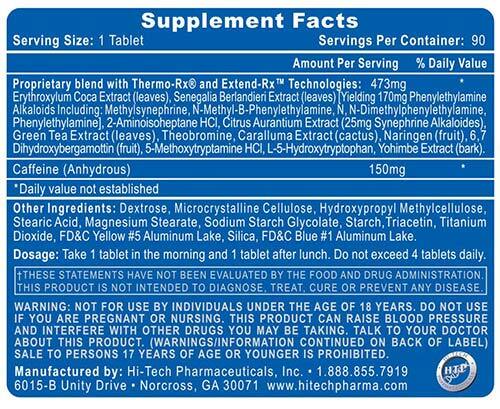 What's In Hi-Tech Pharmaceuticals Lipodrene Elite? How Do I Take Hi-Tech Pharmaceuticals Lipodrene Elite? Take 1 tablet in the morning and 1 tablet after lunch. Do not exceed 4 tablets of Lipodrene Elite daily. I usually take 1 before workout, and it improve focus and performance. Around midday I take yet another, and this way I am not remotely closed to be tempted to do any cheat meals. I tried these based a few reviews. The Lipodrene yellow pills I feel are much better for appetite supression and weight loss. The directions on the Elite read to take 1 and 1, no more than 4 in a day. I took 1 and felt nothing. The next day I tried 2 and felt a little energy but as far as appetite supression they did very little. I have had huge success with the Regular Lipodrene So I'd recommend those instead of the Elite that promote its better but in reality require more and gives you 10 less per bottle. Don't fall for it. This stuff is legit, a big game changer, i consider myself stim tolerant as iv taken many dmaa pwo in high doses, but the feeling from this is different, i take one first thing on a empty stomach and anouther about 5 hours later with a meal and then it real hits me the energy is incredible, very clean very focused and very euphoric, i don't know if it ls the coca or what but iv never felt this good or happy feeling on dmaa before, the appetite suppression is great, this is my number 1 supplement this year! Make sure you drink plenty of water while taking it otherwise you will become dehydrated quickly and will get some headaches. We have a large selection of in-stock Hi-Tech Pharmaceuticals products including Hi-Tech Pharmaceuticals items and others for the lowest prices at SameDaySupplements.com® It's always easy to shop for Lipodrene Elite By Hi-Tech Pharmaceuticals, 90 Tabs at SameDaySupplements.com because you can browse by reviews, brand, prices or search for specific ingredients using our search tool. In-stock orders placed before 3pm EST ship out the same day to USA, Brazil, United Kingdom, Canada, Germany, Australia, Japan, India, France and worldwide at the cheapest prices online.